A disintegrin and metalloproteinase 10 (ADAM10) is a synaptic enzyme that has been previously shown to limit amyloid-β1–42 (Aβ1–42) peptide formation in Alzheimer’s disease (AD). Furthermore, ADAM10 participates to spine shaping through the cleavage of adhesion molecules and its activity is under the control of synaptic plasticity events. 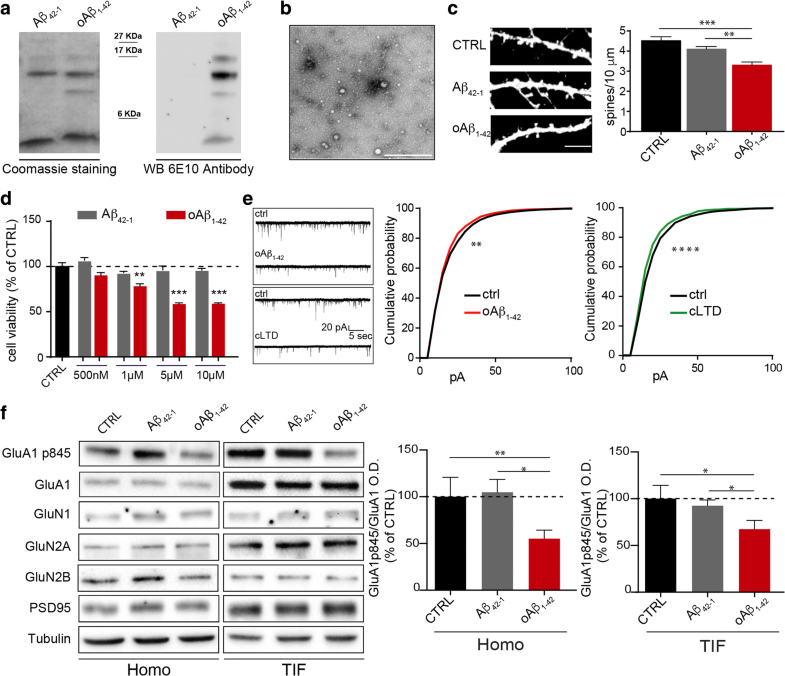 In particular, long-term depression (LTD) promotes ADAM10 synaptic localization triggering its forward trafficking to the synapse, while long-term potentiation elicits ADAM10 internalization. Here, we show that a short-term in vitro exposure to Aβ1–42 oligomers, at a concentration capable of inducing synaptic depression and spine loss, triggers an increase in ADAM10 synaptic localization in hippocampal neuronal cultures. 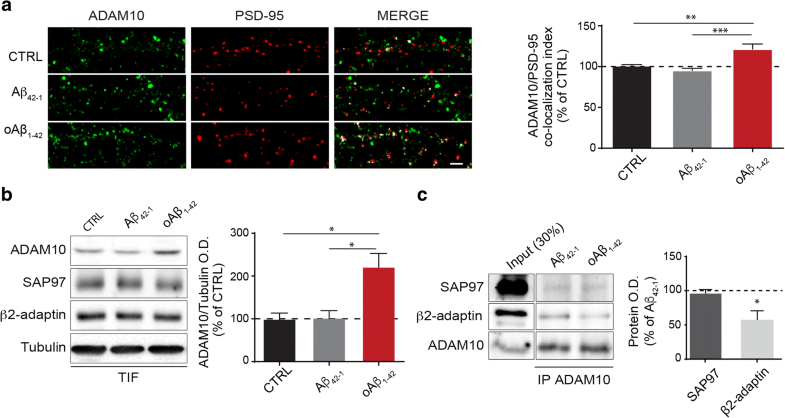 However, the Aβ1–42 oligomers-induced synaptic depression does not foster ADAM10 delivery to the synapse, as the physiological LTD, but impairs ADAM10 endocytosis. Moreover, Aβ1–42 oligomers-induced inhibition of ADAM10 internalization requires neuronal activity and the activation of the NMDA receptors. These data suggest that, at the synaptic level, Aβ1–42 oligomers trigger an aberrant plasticity mechanism according to which Aβ1–42 oligomers can downregulate Aβ generation through the modulation of ADAM10 synaptic availability. Moreover, the increased activity of ADAM10 towards its synaptic substrates could also affect the structural plasticity phenomena. Overall, these data shed new lights on the strict and complex relationship existing between synaptic activity and the primary mechanisms of AD pathogenesis. The online version of this article ( https://doi.org/10.1007/s12035-019-1583-5) contains supplementary material, which is available to authorized users. Disentangling the initial steps of Alzheimer’s disease (AD) pathogenesis from full-blown pathology at a molecular and cellular level remains a key step to fully understand disease onset and progression. In this frame, it has been shown that synapse dysfunction and spine loss represent an early event of the disease rather than just a consequence of cell death . Further, the synapses have been shown to be the main target of the amyloid-β1–42 (Aβ1–42) peptide, whose deposition is one of the main hallmarks of AD [2, 3]. The Aβ1–42 peptide derives from a transmembrane protein, named amyloid-β precursor protein (APP), that is mainly localized in the pre-synaptic active zone and in the post-synaptic compartment in the hippocampus and in the cortex . The concerted action of the β-secretase BACE-1 and the γ-secretase towards APP generates Aβ1–42 . 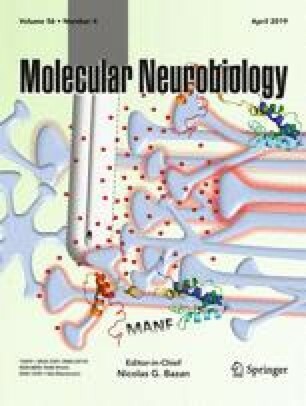 Being APP cleavage mutually exclusive, in neuronal cells, A disintegrin and metalloproteinase 10 (ADAM10) cleaves APP within the Aβ1–42 domain, thus generating the neuroprotective sAPPα and precluding the formation of the Aβ1–42 peptide [6, 7]. The Aβ1–42 homeostasis is regulated by synapse activation: increased activity enhances secretion of Aβ1–42, while reduced activity inhibits it [8, 9]. Coherently, also ADAM10 synaptic levels and activity towards APP are under the control of activity-dependent synaptic plasticity . Long-term depression (LTD) boosts ADAM10 membrane insertion by fostering its SAP97-mediated forward trafficking to post-synaptic membrane, whereas long-term potentiation (LTP) reduces the enzyme membrane levels by inducing AP2-dependent endocytosis . On the other hand, Aβ1–42 can be considered a regulator of neuronal activity  since once released, it affects in turn synaptic transmission and plasticity. In particular, pathological Aβ1–42 levels giving rise to the formation of Aβ1–42 oligomers (oAβ1–42) may indirectly cause a partial block of N-methyl-D-aspartate (NMDA)-type glutamate receptors and shift the activation of NMDA receptors-dependent signaling cascades towards pathways involved in the induction of LTD and synaptic loss [11, 12, 13]. Here, we hypothesize that the oAβ1–42-induced plasticity pathways have a feedback effect on ADAM10 synaptic localization. We show that short-term exposure to oAβ1–42 reduces ADAM10 endocytosis, thus leading to an increase in ADAM10 synaptic localization. This effect is mediated by activation of synaptic NMDA receptors containing the GluN2A subunit. In order to set up a reliable in vitro system to analyze the effect of oAβ1–42 on ADAM10 synaptic localization, we performed a complete characterization of our experimental conditions. First, oAβ1–42 preparation was monitored and controlled by different means. As a negative control, we used a peptide with the reverse sequence of Aβ (Aβ42–1). Coomassie staining and Western Blot analysis with an antibody detecting the N-terminus of Aβ (6E10 antibody) indicated that our oAβ1–42 preparation resulted in a spectrum of oligomeric Aβ species, from 4 up to 16 kDa (Fig. 1a). Transmission electron microscopy (TEM) analysis of oAβ1–42 confirmed the presence of globular, oligomeric structures, while no fibrillar or protofibrillar species were observed (Fig. 1b). Aβ42–1 preparation is mainly constituted of monomers and of aggregated species. Western Blot analysis performed with 6E10 antibody showed no signal in Aβ42–1 samples, as expected (Fig. 1a). Consistent with previous studies [14, 15], we found that oAβ1–42 species at a concentration of 500 nM applied to hippocampal neurons for 24 hours (h) resulted in a significant reduction in spine density as compared to non-treated cultures (CTRL) or to cells exposed to Aβ42–1 (Fig. 1c). Moreover, such concentration of oAβ1–42 did not increase the mortality of the cells after 24 h of treatment, different from higher concentrations as 1 μM, 5 μM, and 10 μM (Fig. 1d). oAβ1–42 species have been shown to facilitate synaptic depression of neurons in acute slices [13, 16]. Accordingly, hippocampal cultures exposed to oAβ1–42 for 30 min displayed a global synaptic depression as indicated by electrophysiological recordings of excitatory post-synaptic current in miniature (mEPSCs) (Fig. 1e) as well as upon the delivery of the classical LTD protocol (20 μM NMDA and 20 μM glycine for 3 min, chemical LTD; Fig. 1e; [17, 18]). Moreover, we used a biochemical approach and we purified the Triton-insoluble fraction (TIF) that is enriched in post-synaptic proteins. As shown in Fig. 1f, the treatment with oAβ1–42 (500 nM, 30 min) induced a significant dephosphorylation of serine 845 of the GluA1 subunit of α-amino-3-hydroxy-5-methyl-4-isoxazolepropionic acid (AMPA) receptors, without any significant change in GluA1 synaptic levels, confirming that this concentration elicits synaptic depression . No changes in the total and synaptic levels of NMDA receptor subunits and in PSD-95 were observed (Fig. 1f; Suppl. Fig. 1A, B). These results suggest that our oAβ1–42 preparation triggers a synaptic depression affecting specifically AMPA mediated conductance. Given that ADAM10 synaptic localization is regulated by synaptic plasticity , can oAβ1–42 modify ADAM10 synaptic levels? To address this issue, we exposed hippocampal neuronal cultures to oAβ1–42 (500 nM, 30 min). As shown in Fig. 2a, bath application of oAβ1–42 significantly increases the co-localization of ADAM10 with a post-synaptic marker, as PSD-95, along dendrites when compared to untreated or Aβ42–1-treated cells. To further confirm these results by a biochemical approach, we purified the TIF. ADAM10 levels were significantly increased in the TIF upon oAβ1–42 treatment (Fig. 2b), indicating that oAβ1–42 promote ADAM10 synaptic localization. We have previously shown that LTD induction fosters the SAP97-mediated ADAM10 trafficking to the synapse . However, no alterations of SAP97 synaptic localization were detected upon oAβ1–42 treatment (Fig. 2b; Suppl. Fig. 2A). In addition, no modifications of the synaptic levels of β2-adaptin, one of the subunits of the AP2 complex responsible for ADAM10 endocytosis , were observed (Fig. 2b; Suppl. Fig. 2B). To determine the cellular mechanism underlying oAβ1–42-induced increase in ADAM10 synaptic localization, we analyzed the association of ADAM10 to SAP97 and AP2 complex. As shown in Fig. 2c, the oAβ1–42 treatment does not alter the interaction with SAP97, while significantly decreases the interaction with β2-adaptin, one of the subunits of AP2 complex. These results demonstrate that acute exposure to oAβ1–42 affects ADAM10 synaptic localization because of a decrease of endocytosis rather than to an increase of forward trafficking. To identify which of the cellular pathways triggered by oAβ1–42 is responsible for the increase in ADAM10 synaptic localization, we analyzed the effect of the blockade of different events. First, we took advantage of the action potential blocker tetrodotoxin (TTX) (500 nM), and we observed that TTX pre-incubation prevents the oAβ1–42-induced increase of ADAM10 in the TIF (Fig. 3a), indicating the involvement of neuronal synaptic activity. In the adult forebrain, synaptic NMDA receptors are predominantly di-heteromeric GluN1/GluN2A and tri-heteromeric GluN1/GluN2A/GluN2B receptors [20, 21]. In light of this observation and considering the key role of GluN2A-containing NMDA receptors in plasticity phenomena [22, 23], we examined the effect of NVP-AAM077, a GluN2A-preferring antagonist . The analysis of ADAM10 levels in the TIF shows that the presence of NVP-AAM077 fully prevents the increased localization of ADAM10 in the synapses induced by oAβ1–42 (Fig. 3b). Notably, the presence of ifenprodil, an antagonist of GluN2B-containing NMDA receptors, does not affect the oAβ1–42-triggered increase in ADAM10 synaptic levels, thus indicating the specific involvement of GluN2A-containing NMDA receptors (Suppl. Fig. 3). In this study, we provide evidence for aberrant plasticity phenomena by which oAβ1–42 control synaptic function and the generation of Aβ1–42 itself. Primary hippocampal cultures were treated with a preparation of oAβ1–42 able to induce synaptic depression in 30 min and spine loss in 24 h, in the absence of cell death. In these experimental conditions, oAβ1–42 short-term exposure results in an increase in ADAM10 synaptic availability. Although it has been shown that LTD fosters SAP97-mediated ADAM10 delivery to the post-synaptic compartment , oAβ1–42 treatment leads to a decrease in the association between ADAM10 and AP2 complex, which is responsible for the endocytosis of the enzyme, without affecting the binding to SAP97 (Fig. 3c). Therefore, the increase in ADAM10 synaptic localization is due to the impairment of its endocytosis rather than to a stimulation of its forward trafficking, suggesting that the molecular pathways underlying physiological LTD and regulating ADAM10 are profoundly different from those responsible for oAβ1–42-induced depression. Considering that several studies demonstrated that oAβ1–42 inhibit the maintenance of hippocampal LTP [8, 25, 26] and that ADAM10 endocytosis is regulated by LTP, we can also hypothesize that the oAβ1–42-induced impairment in ADAM10 endocytosis is in line with a disorder in mechanism of LTP. Thus, overall our data indicate that oAβ1–42 triggers aberrant plasticity phenomena. We provide also a mechanistic inside for this aberrant plasticity of oAβ1–42 action. oAβ1–42 engage a pathway that requires neuronal activity and the activation of the GluN2A-containing NMDA receptors. Even if several studies reported the role of the extra-synaptic GluN2B-containing NMDA receptors [27, 28, 29], our data highlight that acute exposure to oAβ1–42 triggers a synaptic event that involves GluN2A-containing NMDA receptors. Indeed, the presence of an inhibitor of GluN2B-containing NMDA receptors does not prevent the oAβ1–42-induced increase in ADAM10 synaptic localization. Taken together, these data suggest that a short-term exposure to oAβ1–42 engages a negative feedback mechanism according to which oAβ1–42 can downregulate Aβ generation through the modulation of ADAM10 synaptic availability. Moreover, the increased activity of ADAM10 towards its synaptic substrates could tune synaptic transmission and structural plasticity. It has been shown that the sAPPα, which is released after ADAM10 cleavage of APP, is able to acutely modulate synaptic strength when applied in vitro . Furthermore, ADAM10-mediated shedding of N-cadherin controls spine shaping and AMPA receptors function . Overall, here, we show that oAβ1–42 can trigger aberrant plasticity pathways and, thereby, affect synaptic plasticity. Since the synapses are considered to be an early site of pathology in AD  and loss of synapses is the best pathologic correlate of cognitive impairment in AD patients , understanding the molecular underpinnings leading to synaptic dysfunction will aid in the development of tailored synapse-targeted therapies for AD. Aβ1–42 and Aβ42–1 peptides were purchased from Bachem (Bubendorf, Switzerland) and oligomers were prepared according to . The lyophilized peptides were dissolved in 1,1,1,3,3,3-hexafluoro-2-propanol (HFIP; Sigma, St. Louis, MO, USA) and aliquoted before removing HFIP. oAβ1–42 were obtained by incubating at 4 °C for 24 h in Neurobasal medium without Phenol red. The quality of the oligomer preparation was controlled separating the protein onto a 13% Tris-Tricine gels and performing Coomassie staining and western blots against the amyloid-β peptide (6E10; Covance, CA, USA). To analyze the presence of oligomeric and fibrillar forms, TEM experiments were performed by applying 5 μl of protein suspension to a glow-discharge coated carbon grid (Cu 300 mesh, Electron Microscopy Sciences, PA, USA) for 1 min and then negatively stained with 2% Uranyl acetate. Sample was observed at an EFTEM Leo912ab (Zeiss, Germany) operating at 100 kV and digital images were acquired by a CCD camera 1kx1k (Proscan, Germany) and iTEM software (Olympus, Germany). Primary hippocampal neurons cultures were prepared from embryonic day 18–19 rat hippocampi as previously described . The Institutional Animal Care and Use Committee of University of Milan and the Italian Ministry of Health (#326/2015) approved all the experiments involving primary neuronal cultures preparation. Neurons were transfected with eGFP plasmid using the calcium phosphate precipitation method at 10 days in vitro (DIV) for spines density analysis. All the treatments were performed at DIV14 using the following reagents concentrations: either oAβ1–42 or Aβ42–1 500 nM (30 min), NVP-AAM077 (GluN2A-containing NMDA receptor antagonist, TOCRIS, Bristol, UK) 50 nM (pre-incubation of 15 min), TTX (Tetrodotoxin, TOCRIS) 500 nM (pre-incubation of 15 min), and ifenprodil (GluN2B-containing NMDA receptor antagonist, TOCRIS) 3 μM (pre-incubation of 5 min). Neuronal cultures were treated with either oAβ1–42 or Aβ42–1 at different concentrations (500 nM, 1 μM, 5 μM, and 10 μM) and, after 24 h, the MTT test was performed according to  to evaluate the cells viability. After treatment, samples were processed for the purification of the Triton-insoluble fraction (TIF), a fraction enriched in post-synaptic density proteins . After quantification, total homogenate and TIF proteins were resolved with SDS-PAGE method; co-immunoprecipitation experiments were performed as described in [10, 35]. The following antibodies (Ab) were used: ADAM10 purchased from Abcam ab39153 (Cambridge, UK), SAP97 from Stressgen ADI-VAM-PS005-D (San Diego, CA, USA), β2-Adaptin from BD Bioscience 610382 (NJ, USA), Tubulin T9026 and GluN2A M264 from Sigma-Aldrich, GluA1 75-327, PSD-95 75-028, GluN2B 75-097, and GFP 75-132 from Neuromab (Davis, CA, USA), GluA1-p845 04-1073 and 6E10 SIG39320-200 (Covance) from Millipore (Billenca, MA, USA), and GluN1 320500 from Thermo Fisher (Waltham, MA, USA). Peroxidase-conjugated secondary Abs were purchased from Bio-Rad (Hercules, CA, USA). AlexaFluor secondary Abs were purchased from Thermo Fisher. For ADAM10/PSD-95 co-localization and spine morphology studies, treated hippocampal neurons were fixed 7 min in 4% paraformaldehyde plus 4% sucrose in phosphate buffered saline (PBS) at room temperature. Then, cells were extensively washed with PBS supplemented with CaCl2 and MgCl2, permeabilized with 0.2% Triton-X100 and incubated for 2 h at room temperature with 5% BSA in PBS. Primary and secondary antibodies were applied in 5% bovine serum albumin (BSA) in PBS. Cells were labeled with primary antibodies overnight at 4 °C. Cells were washed and then incubated with secondary antibodies for 1 h at room temperature. Cells were then washed in PBS and mounted on glass slides with Fluoromount mounting medium (Sigma-Aldrich). Fluorescence images were acquired by using Zeiss Confocal LSM510 system (Zeiss, Jena, Germany) with a sequential acquisition setting at 1024 × 1024 pixels resolution; for each image, two up to four 0.5-μm sections were acquired and a z projection was obtained . Whole-cell patch-clamp recordings of mEPSCs were obtained from DIV 15–16 neurons using a Multiclamp700A amplifier (Molecular Devices) and pClamp-10 software (Axon Instruments, Foster City, CA). Recordings were performed in the voltage-clamp mode. Currents were sampled at 5 kHz and filtered at 2–5 kHz. Recording pipettes, tip resistances of 3–5 MΩ were filled with the intracellular solution of the following composition (in mM): 130 potassium gluconate, 10 KCl, 1 EGTA, 10 Hepes, 2 MgCl2, 4 MgATP, 0.3 Tris-GTP. At the beginning of the experiment, mEPSCs have been recorded in the external solution [Krebs’ Ringer’s-HEPES (KRH)] with the following composition (in mM): 125 NaCl, 5 KCl, 1.2 MgSO4, 1.2 KH2PO4, 2 CaCl2, 6 glucose, 25 HEPES-NaOH, pH 7.4 in which also TTX (0.5 μM), bicuculline (20 μM, Tocris, Bristol, UK), and strychnine (1 μM, Sigma-Aldrich, Milan, Italy) were included. Then, to induce chemical LTD, we applied NMDA (20 μM) and glycine (20 μM, Sigma-Aldrich, Milan, Italy) for 3 min at room temperature in Mg2+-free KRH containing TTX (0.5 μM), bicuculline (20 μM), and strychnine (1 μM). Thirty minutes after this treatment, mEPSCs have been collected again in the starting KRH solution. Synaptic depression has been also induced in cultures by 30 min of oAβ1–42 (500 nM) in Mg2+-free KRH containing only TTX (0.5 μM), bicuculline (20 μM) and strychnine; at the end of this treatment, mEPSCs have been recorded in normal KRH and analyzed. Off-line analysis of miniature events was performed by the use of Clampfit- pClamp-10 software. Quantification of Western Blot analysis was performed by means of computer-assisted imaging (Image Lab, Biorad). The levels of the proteins were expressed as relative optical density (OD) measurements and normalized on tubulin. Values are expressed as mean ± S.E.M. of at least three independent experiments. Co-localization analysis was performed using Zeiss AIM 4.2 software and spines analysis was performed with ImageJ software (National Institute of Health, Bethesda, MD, USA). For co-localization, and morphological analysis, cells were chosen randomly for quantification from 4 different coverslips (2–3 independent experiments), images were acquired using the same settings/exposure times, and at least 10 cells for each condition were analyzed. Statistical evaluations were performed by using 2-tailed Student’s t test (a p value less than 0.05 was considered significant) or, when appropriate, by using one-way ANOVA followed by Bonferroni’s post hoc test or Kruskal-Wallis analysis of variance followed by Dunn’s post hoc test. We thank A. Longhi and E. Zianni for technical assistance. Acknowledgement is made to the donors of the Alzheimer Disease Research, a program of the BrightFocus Foundation, for supporting EM. SM, EM, LV, and SP carried out and analyzed the biochemical and confocal imaging experiments. NS performed TEM study. FA carried out electrophysiological experiments and their analysis. EM, SM, and MDL conceived the study and wrote the manuscript. FG and FA contributed to the writing. All authors read and approved the final manuscript. This project has received funding from the European Union’s Horizon 2020 research and innovation program under the Marie Skłodowska-Curie grant agreement No 676144 (Synaptic Dysfunction in Alzheimer Disease, SyDAD) to MDL, from the Italian Ministry of University and Research (PRIN 2015N4FKJ4 to MDL, FFABR to EM, MIUR Progetto Eccellenza), from AIRAlzh Onlus-COOP Italia (fellowship to SP), from the Veronesi Foundation Young Investigator Research Programme 2013 (to EM), from the Alzheimer’s Association (NIRP-14-304969, to EM), from an Alzheimer Disease Research program research fellowship of BrightFocus Foundation (A2014314F, to EM), from an intramural grant of University of Milan to EM (Fondo di sviluppo unimi- linea2 - PSR2017_DIP_022_03), from an intramural grant of University of Milan to FA (“Piano di Sostegno alla Ricerca, Linea 2 - Progetto giovani ricercatori”, BIOMETRA Department). This work was supported by MIUR - PON “Ricerca e Innovazione” PerMedNet id project ARS01_01226. The Institutional Animal Care and Use Committee of University of Milan and the Italian Ministry of Health (#326/2015) approved all the experiments involving primary neuronal cultures preparation.